Don’t hold your breath waiting for a silver bullet. Herbicide-resistant weeds have weed scientists searching for new options. Photo by Bruce Barker. Some old, some new and some maybe coming – sometime. That’s the state of pulse herbicides in Western Canada. Very few new herbicides have been registered in the last decade. As pulse crops such as pea, lentil, and chickpea became more common across the Prairies, so did registrations for weed control in those crops. Prior to the Group 2 imi-chemistries being registered in 1990, a group of herbicides formed the foundation of weed control. Some were pre-emergent and others post-emergent. Trifluralin, ethalfluralin (Group 3), metribuzin (Group 5), MCPA amine/sodium salt (Group 4), Tropotox Plus (Group 4), Basagran (Group 6), Pea Pack (Sencor/MCPA) (Group 5 plus 4) were the mainstays in what was mostly pea production in the era from 1970 to 1990. Use of these herbicides faded as the Group 2 imi-herbicides Pursuit, Odyssey, Solo and Ares were registered in the early 1990s, followed up with the introduction of Clearfield lentil in 2007. In 2002, the Pesticide Minor Use Program was introduced, and research at Agriculture and Agri-Food Canada and the University of Saskatchewan provided data for new herbicide registrations in pulse crops. These included the Group 14s carfentrazone (Aim), sulfentrazone (Authority), flumioxazin (Valtera); and Group 15 pyroxasulfone (Focus, Zidua). At the time, BASF also introduced Group 14 saflufenacil (Heat); Viper (imazamox plus bentazon; Group 2 plus 6). Nufarm also introduced pyraflufen plus MCPA (Goldwing; Group 14 plus 4). “A lot of these chemistries were old modes of action, but new to Western Canada,” Johnson says. The biggest challenge that growers now face is widespread Group 2 resistance with all kochia found on the Prairies considered Group 2 resistant. Other emerging threats include Group 2 cleavers in the Black and Dark Brown soil zones, wild mustard resistance in central Saskatchewan around Kindersley, and resistant stinkweed in western Saskatchewan. Johnson says quite a few of the most recent pulse herbicides are soil active and require moisture to be effective. They tend to be less consistent because of environmental interactions, and are generally not as broad spectrum as some of the older chemistries. Crop tolerance, especially lentil, is also a concern with the soil active chemistries. “Clearfield lentil changed grower expectations of weed control and crop safety – both were very good. Those expectations can’t be as high with these new soil active chemistries as they were when Odyssey first came out,” Johnson says. A new registration on chickpea and lentil is the registration of Goldwing (pyraflufen plus MCPA ester; Group 4 plus 14). Already registered on field pea, Goldwing is a pre-seed burndown herbicide that controls a range of broadleaf weed herbicides through contact and systemic action. It can also be tank-mixed with glyphosate for enhanced control and improved herbicide resistance management. “With multiple modes of action, Goldwing gives farmers more options to control resistant weeds like Group 2 and 9 resistant kochia, or Group 2 and Group 5 resistant redroot pigweed,” says Graham Collier, Nufarm technical services manager for Western Canada in Alliance, Alta. Nufarm is also working on registration of Fierce (flumioxazin plus pyroxasulfone; Group 14 plus 15) for application prior to seeding pulse crops. Fierce is already registered on soybeans, spring wheat (not durum) and field corn for residual control of broadleaf and grass weeds including Groups 1, 2, 4, 5 and 9 biotypes. Chickpea weed control will be less challenging with the development of IMI-tolerant varieties, although the herbicides won’t control Group 2 resistant weeds. The first IMI-tolerant chickpeas developed were CDC Alma (kabuli) and CEC Cory (desi). 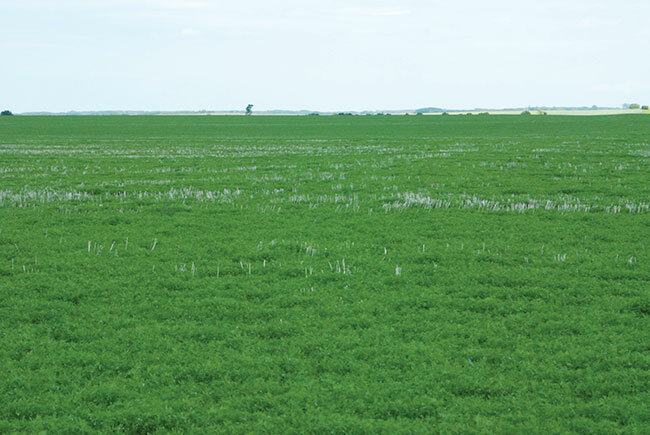 The Prairie Pesticide Minor Use Consortium has submitted the application for Solo herbicide use on IMI-tolerant chickpea to the Pest Management Regulatory Agency (PMRA). Once Solo is registered, the IMI-tolerant chickpea varieties will be released. All future chickpea varieties developed at the Crop Development Centre will carry the IMI-resistant technology. A potential new chickpea herbicide is a Group 6 active pyridate. It is an older chemistry that was investigated in the 1990s by Syngenta and is now with Engage Agro, which is working on a new formulation. The trade name is Tough 5EC, and it is a post-emergent product with a contact mode of action and no residual. 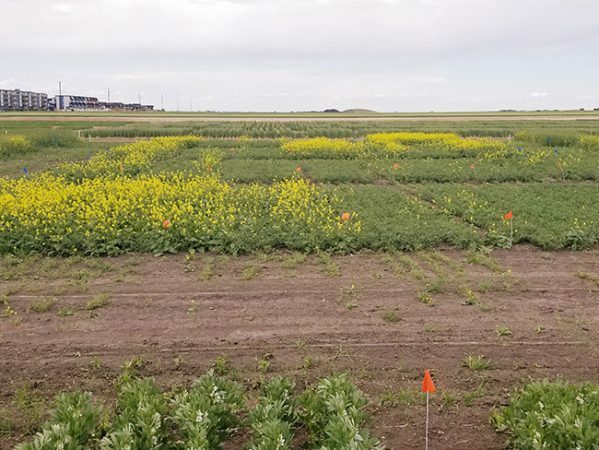 More recently, pyridate was re-evaluated as part of a large pulse weed control research led by Dr. Chris Willenborg at the University of Saskatchewan and funded by the Saskatchewan Pulse Growers. Chickpea tolerance was very good to pyridate and provided acceptable control of wild mustard at a rate of 900 grams of active ingredient per ha-1. It works on a number of broadleaf weeds and is strong on kochia, pigweeds, and lambs-quarters. Engage Agro is working on a submission for registration. Wild mustard control in chickpea with pyridate: untreated on left (plot 1); pyridate applied at 450 g ai/ha (plot 2), 900 g ai/ha (plot 3), and 1800 g ai/ha (plot 4). Photo by Eric Johnson. Several recent registrations have given lentil growers more options for weed control. Focus (pyroxasulfone plus carfentrazone; Group 15 plus 14) controls some grassy and broadleaf weeds. It is applied pre-plant or pre-emergent in the early spring or fall. Valtera, a Group 14 herbicide, is another pre-emergent residual herbicide registered on chickpea, field pea, and lentil. It provides residual control of some broadleaf weeds including redroot pigweed, lamb’s quarters, dandelion, kochia and Canada fleabane. Johnson says growers should understand that Valtera and Focus are not Edge substitutes in lentil. Valtera is fall-applied and provides good control of winter-annual weeds (including narrow-leaved hawk’s beard), and the first major flush of kochia. However, there isn’t enough residual to provide season-long control of kochia flushes. Focus can be very effective on cleavers if soil organic matter is less than six per cent. Focus is also very good on downy and Japanese brome. Other weed control is environment dependent. Johnson cautions to not overuse Group 14 herbicides because of weed resistance selection pressure. He says Valtera in the fall followed up by Heat in the spring will exert more selection pressure for weed resistance. A recent registration in November 2018 on lentil, field pea, soybean and corn was Heat Complete (saflufenacil + pyroxasulfone). In a tank-mix with glyphosate, the pre-seed burndown will control a wide range of broadleaf and grass weeds, for the control or suppression of Group 1, 2 and 9 resistant weeds. “Heat Complete combines the advantages of a Heat LQ and glyphosate burndown along with extended residual activity on tough-to-control weeds. The real drivers are residual suppression of kochia and wild oat,” says Dan Packer, pulse crop manager with BASF in Mississauga, Ont. Managing herbicide resistance in pulses is also more and more dependent upon herbicide layering. Herbicide layering is a concept using both pre- and post-emergent modes of action. A pre-emergent herbicide provides short to mid-term residual control and reduces weed populations for post-emergent control. In field pea, managing Group 2 herbicide resistance is becoming increasingly important. An example of herbicide layering to manage Group 2 resistant cleavers in field pea would be to use a pre-emergent herbicide like Edge (fall-applied and heavy harrowed) or Authority or a Heat herbicide. This application would be followed up with an in-crop post-emergent application of Viper or Basagran. Two years of research in Rosthern, Sask., on soils with organic matter greater than six per cent found Edge fall-applied plus Heat pre-emergent followed up by Viper post-emergent produced around 90 per cent control of Group 2-resistant cleavers. Screening for potential Minor Use applications has been conducted on several herbicides. These include Heat, Authority, Viper, Valtera and Focus. Data is being generated to support potential applications, but none are registered on fababean at this time.